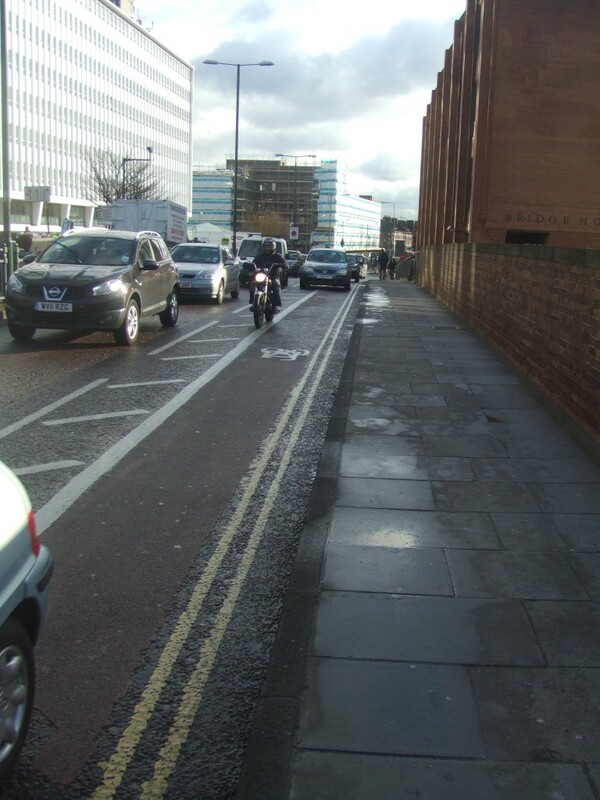 Once upon a time there were two narrowish advisory cycle lanes down this rather nasty ( high speeds and traffic volume) between Kingston Bridge and Hampton Court Bridge. LB Richmond decided that these were ineffective and decided with little consultation to put a 2-way cycle track on the north side from Church Grove but ending about half way down the road. If you were crossing Kingston Bridge you would have to cross somehow to the north side and re-cross with even less assistance half way to Hampton Court. Unsurprisingly cyclists tend not to do that but were continuing on the north footway to the annoyance of local residents. 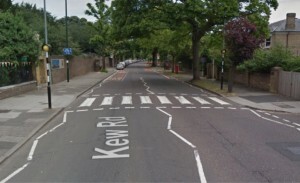 We have given initial though to widening the footway on the northern side of the road, as a continuation to the existing off road facility to the Chestnut Avenue junction. 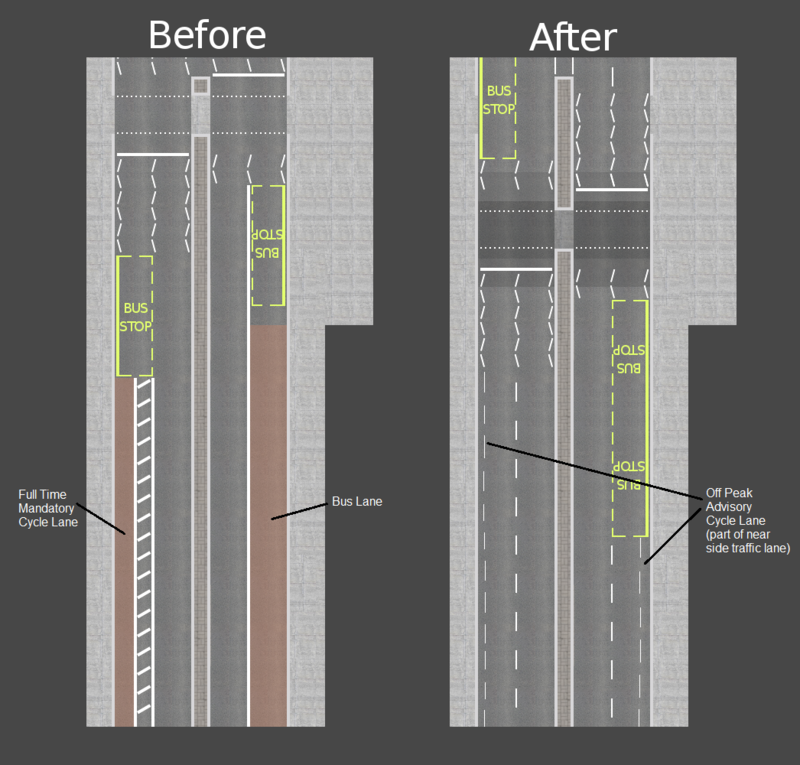 This will reduce the road width to 7.0m but would provide a general 4.0m shared footway (some variations in places). In order to implement this, it would be necessary to remove the two existing on road cycle lanes. We will also be looking at crossing cyclists at the Chestnut Avenue zebra, with continued shared use to the HCR roundabout. 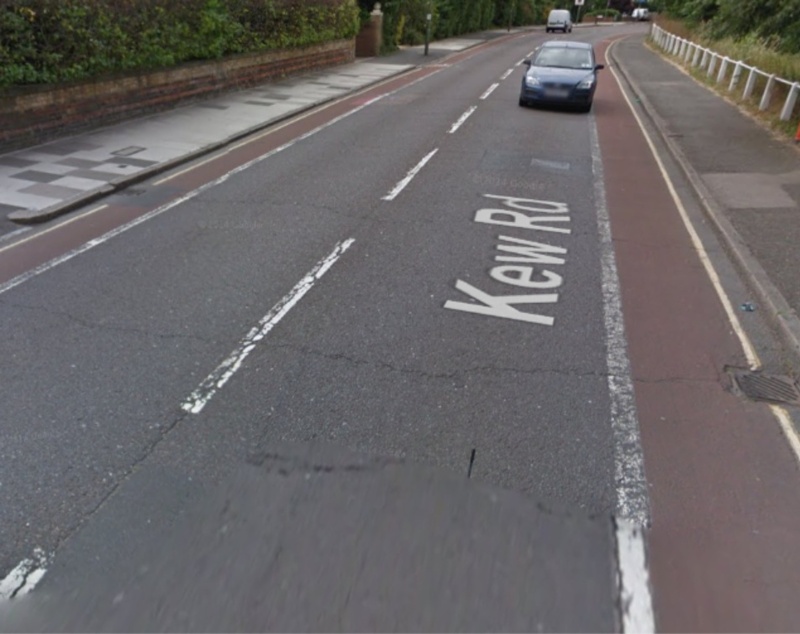 The road width reduction would be beneficial in reducing vehicle speeds as there is an issue with vehicles travelling well above the 30mph speed limit. As part of this project we will also be giving consideration to how we link the roundabout to the existing off road facility further along HCR, past the green and the Esso garage. I would like to stress that this is only being considered at this stage and is not yet out to public consultation. Your initial views would be welcome. My initial view was that this was some improvement on the current situation whilst still wistfully thinking that if Richmond and Surrey could get their act together we could have a continuous track on the south side from Kingston to Esher. Comments from users welcome. We went along to the Environment, Sustainability and Community Overview and Scrutiny Committee (trying saying that after a few jars!) meeting on Monday 7 January. We were hopeful that our comments made back in November would have been taken on board. This post by a local cyclist summed up the potential that could be achieved. Sadly we were to be disappointed. 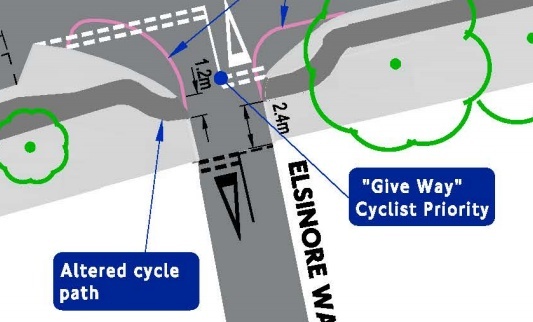 Disjointed, advisory cycle lanes that form part of the nearside motor lane, no consideration at junctions other than ASLs, a taxi rank to dodge – you can read the full plans here (PDF 5MB) Not a design that parents will feel happy about cycling to school with their kids on. 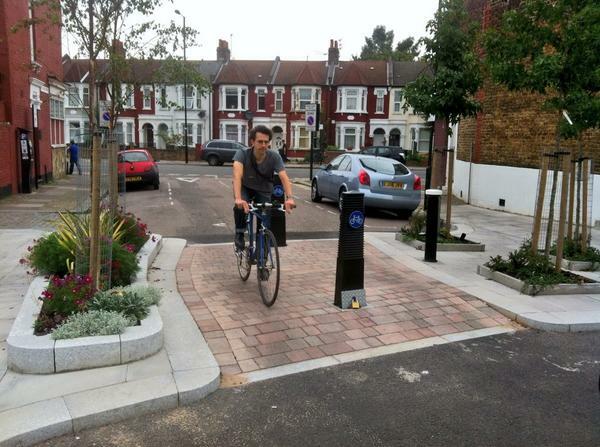 We were somewhat exasperated by the council boasting that they were being generous by giving 1.5 m cycle lanes. While this may be generous compared to the usual treatment in the borough (e.g. the recent cycle lanes on the approach to Richmond Bridge) this is the absolute minimum width recommended by the London Cycle Design Standards (yes, they do exist!). Perhaps the Richmond officers need a refresh. Until the council treats cycling as a means of transport, with officers who actually use the designs they come up with, we won’t see more people taking to their bikes to cycle to work, school or the shops. 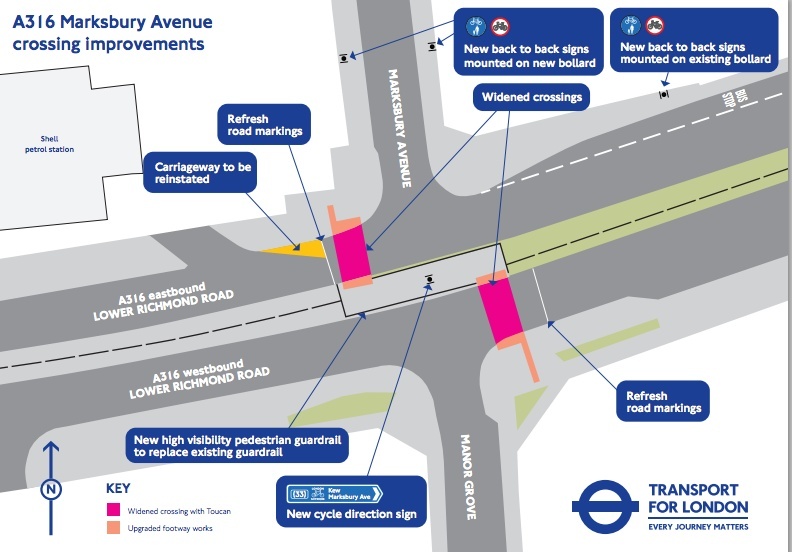 Across London, other councils are waking up to this – read how Ealing council went to Copenhagen, even TfL are starting to rethink their designs. We only hope this will eventually happen in Richmond. In the meantime, here’s your Olympic legacy. 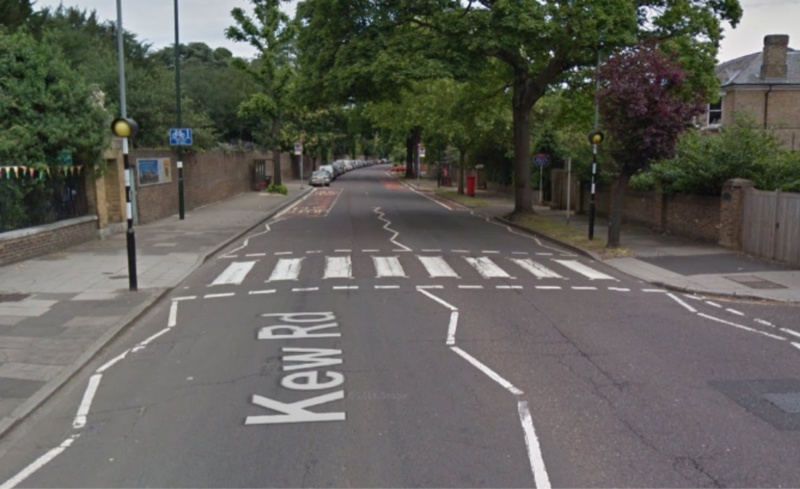 Which is a shame, because when you look at this post by a local parent, you see what could have been achieved with the space available and some political will – a vibrant Twickenham people go to, not drive through. London Road Cycle lane saved? Since our last post on the subject of the Twickenham Town Centre proposals in October a lot has been going on in the background. There was the council cabinet meeting on 15 November and then we met with council officials on 23 November. So we felt it was worth putting up an update. For a reminder on the history of the changes have a look at this post. Having found out from the council’s own safety audit states that the proposed changes changes were likely to lead to “an increase in cyclist/vehicular collisions or cyclist/pedestrian collisions” we went to this meeting determined to get the council to listen. 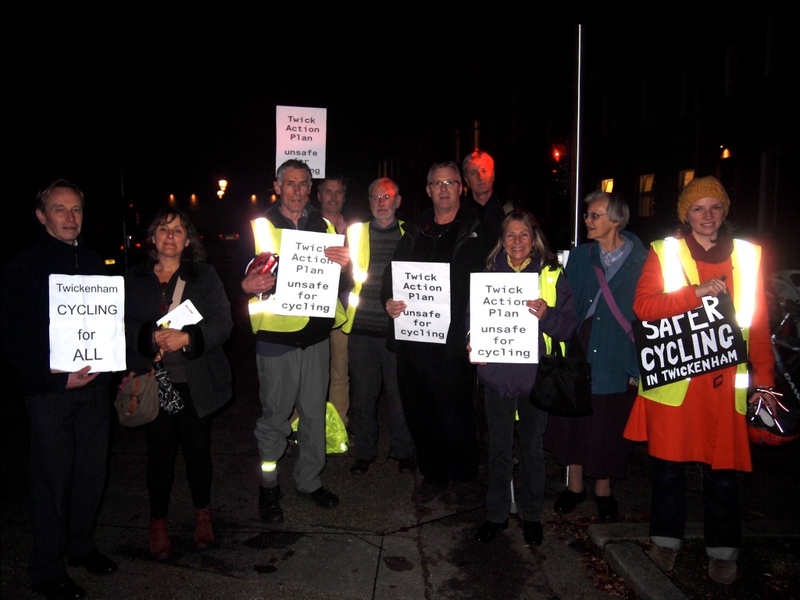 There was a big turn out of cyclists at the meeting, many bringing placards to get across their frustrations. 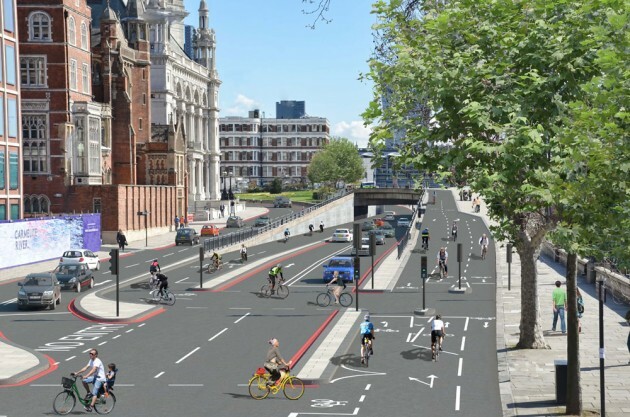 At that stage, there was still limited specific detail on what the council was actually proposing but there was an indication that the council was softening its position and that existing cycle lanes would be retained and new ones added. The most enlightening element of the meeting was that Cabinet Chair, Lord True, was genuinely shocked to hear that we were not allowed to discuss infrastructure issues at the council’s Cycling Liaison Group meetings. 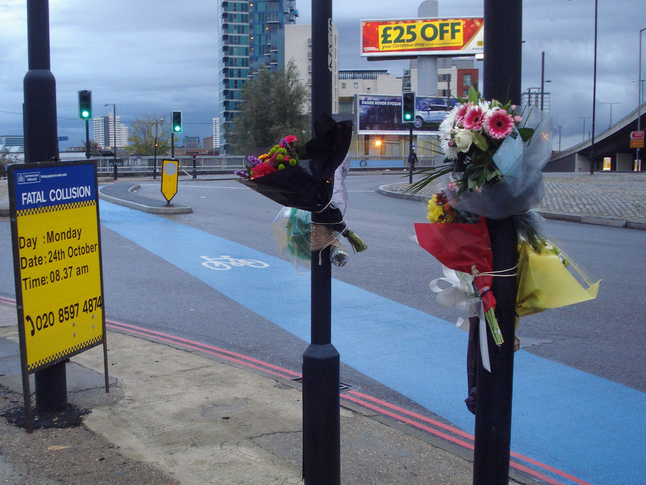 The council’s Cycling Champion was not in attendance at the cabinet meeting to explain why. We emphasised that safety at junctions still needed to be addressed and that we would need to see the firmed-up proposals before the go-ahead is given. No official minutes were produced of the meeting, but here are the notes that we took down and shared with the council after the meeting. It is a vast improvement of where we were at the start of the summer when all cycle lane provision was going to be removed. Since November, we haven’t heard any more on the subject and our concern is that decisions are being made in the background without our knowledge. Perhaps we’re worrying without cause but our experiences with the council to date haven’t helped. We will continue keep the pressure on the council to stick to these commitments and look for opportunities to further improve the scheme. There is a danger that despite everyone’s efforts, this will fall off the radar. With the upcoming Rugby World Cup, changes may be pushed through that in the long term compromise the safety and viability of Twickenham town centre for those that visit and work there. Contact your local councillors, the council’s Cycling Champion, Kat Harborne, the chair of the Transportation Committee Councillor Chris Harrison and the Principal Transport Planner Ben Fryer to make sure they haven’t forgotten and to get their commitment to the changes discussed in November. If you’re writing to your Councillor, feel free to cc us via info@richmondlcc.co.uk and we’ll keep a note of it. There was a big a big attendance of cyclists at Thursday’s Cycle Liaison Group meeting with Richmond council, showing the strength of feeling about the changes to Twickenham town centre. 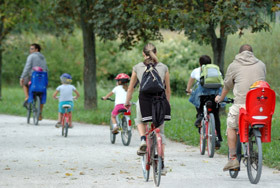 London Cycling Campaign covered the subject on their website. Many told us they had never taken part in a meeting like this before, but felt compelled to come along to make their voice heard. A big thank you them and to the many others who couldn’t but emailed their support and a thank you to Richmond council for adding the subject to the agenda. The meeting can be split into two parts – the original agenda (in which we learnt a lot about bat friendly lighting) and the bit that everyone went to hear about. Local cyclist Tim Lennon wrote up very effectively about both parts. The council has stated that it is listening to our concerns, which is welcome to hear, and that the changes are not yet a done deal, though we are concerned about previous information that they would be ratified at the Council Cabinet meeting on 18th October. 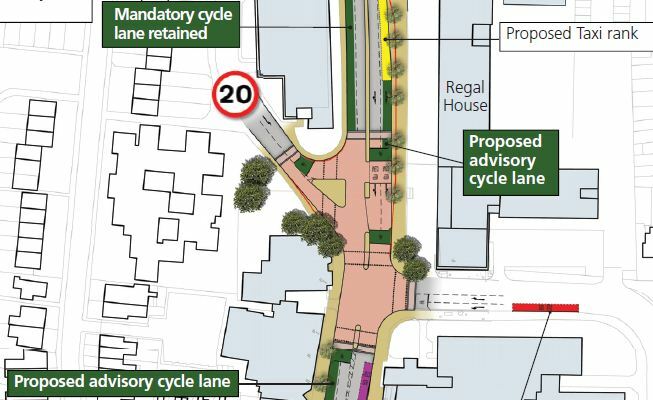 They now say that they are going to install cycle lanes throughout Twickenham town centre, but these still appear to be the advisory, off peak only, cycle lanes, which will form part of the nearside motor lane, rather than an extra width. 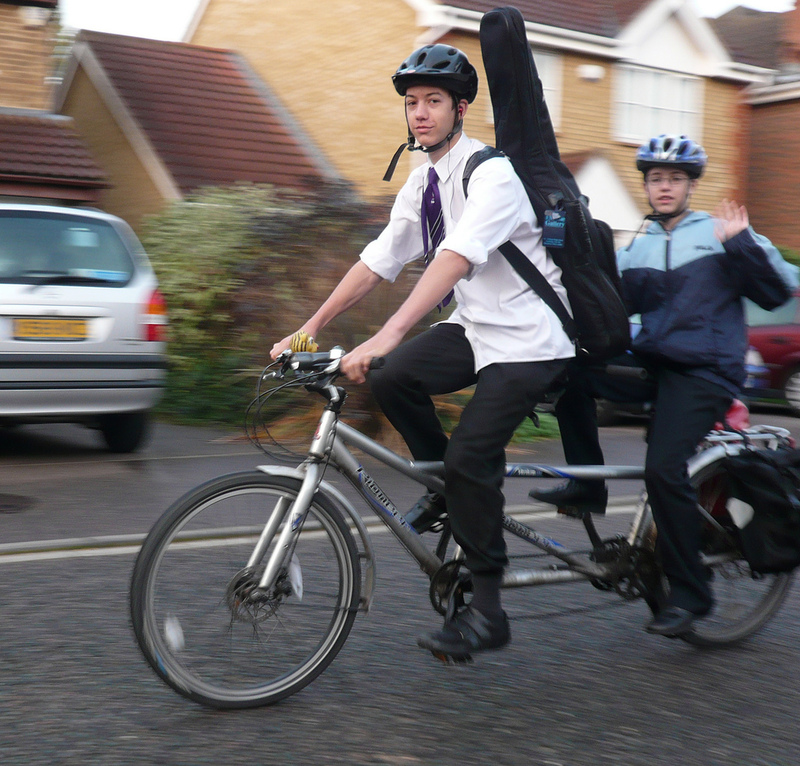 We still feel strongly that this is inadequate, given at peak times, when parents are cycling to school with their kids or people are cycling to work, the most protection is needed. In the words of one of the attendees, ‘they are as useful as a chocolate teapot’ but it does show they now realise the original plans were inadequate. 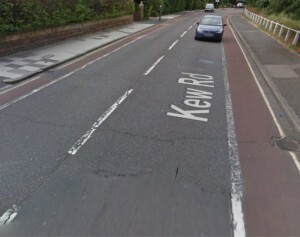 No detail is available on these lanes or consideration of the safety of junctions. There is no detail on when the new updated proposals will be available for review. We hope that, unlike the recent cycle lane installed on the approach to Richmond bridge, the lane just doesn’t peter out when the going gets tough. The subject of our next steps will be on the agenda at our monthly meeting, this Monday 8 October, at 8pm in the Old Ship pub in Richmond. We shall discuss what we do next, including follow up with TfL to understand their involvement. TfL will be critical, as they are part funding the changes. Come along and share your views, or if you can’t make it, email us on info@richmondlcc.co.uk. 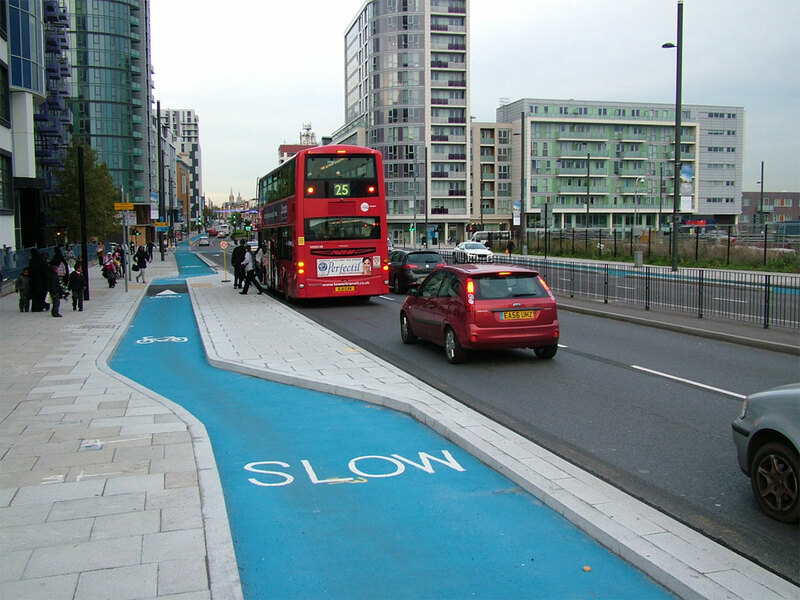 That they consider the principals of LCC’s Love London Go Dutch campaign and incorporate the best practice from the Netherlands and Denmark to provide protected cycle lanes. 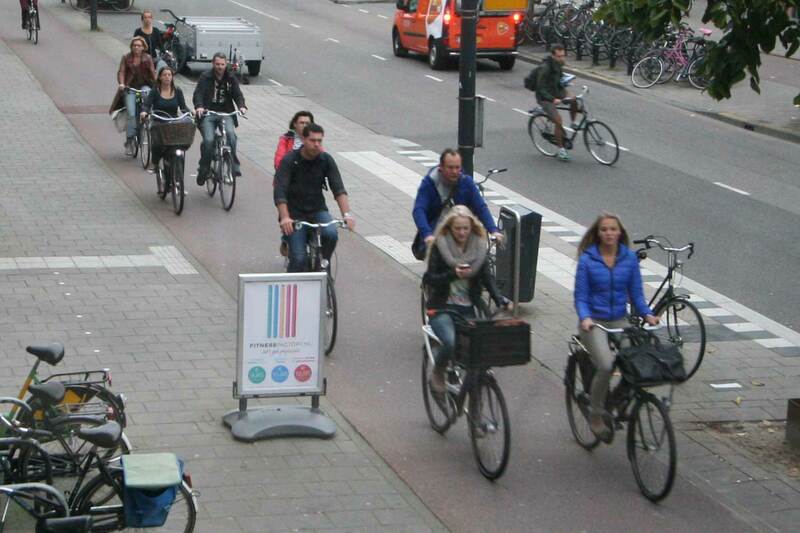 For example, the space is there to do this and still provide wider pavements on King Street. Have a look at a similar street in the Netherlands. 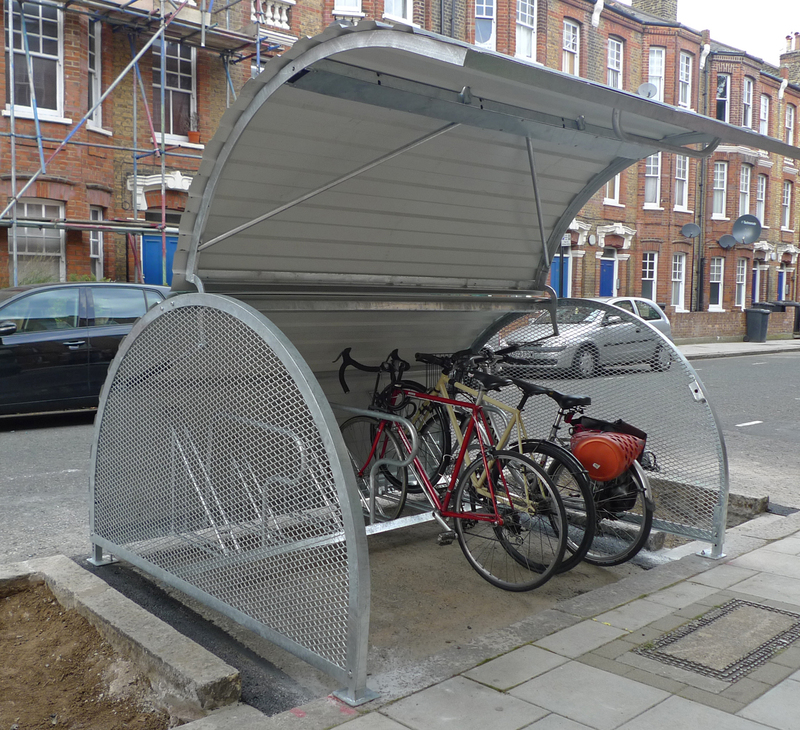 As Tim puts it, everyone should be concerned about the provision of cycling infrastructure in Twickenham, regardless of whether you cycle or not. – Come along to the Council cabinet meeting on the 18th October – This is the best chance to get your points put directly to the cabinet members responsible (full list of cabinet members and contact details here) You can even register to ask a question on the night. 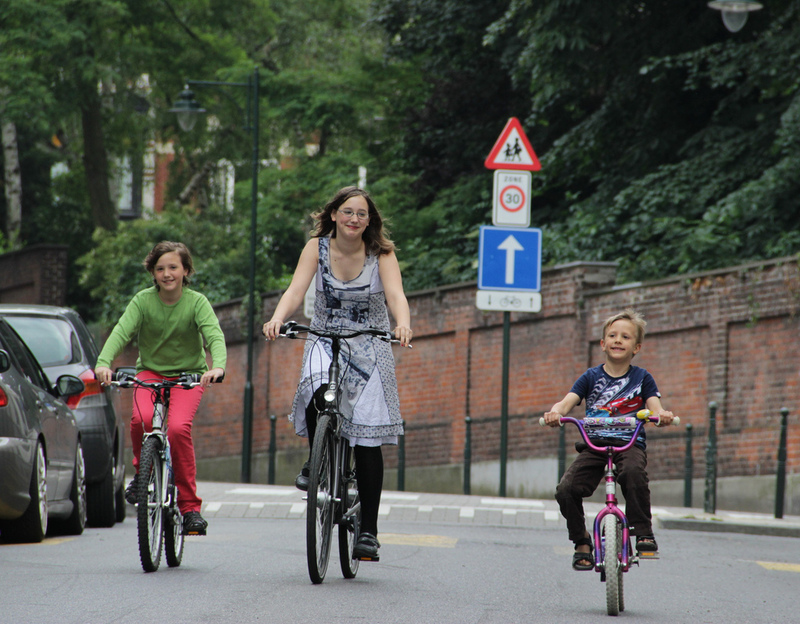 July 2012 – and we find out what the proposals are – removal of cycle and bus lanes and a consultation (in the form of a tick box, do you support these proposals) comes out. The results were promising, 67% opposed the removal of the existing London Road mandatory cycle lane. Surely they would now listen. October 2012 – After several attempts, the council agrees to update the agenda for the upcoming CLG meeting to include discussion of the cycle lanes. Local blogger Tim Lennon stated very simply the flaws with what the council is proposing. Interesting debate in the comments section to the article in the Richmond and Twickenham Times.